ReSurfaced is coming back with a splash of bourbon. 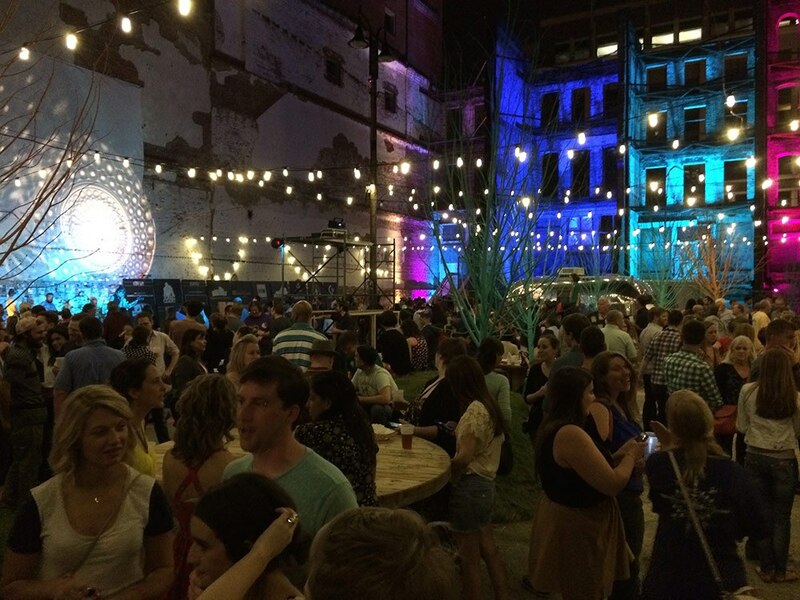 But what does the pop-up space mean for the future of Louisville urbanism? It’s been seven months since Louisville’s biggest Tactical Urbanism experiment, Resurfaced on Main, shut its doors. 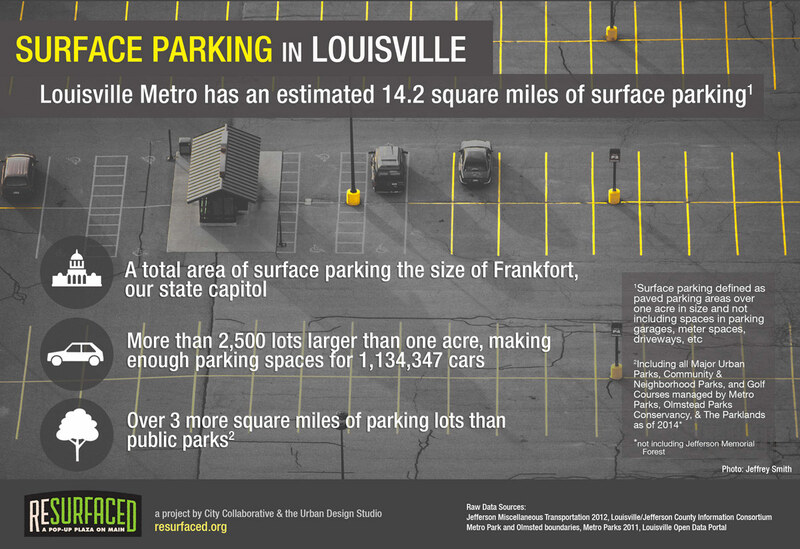 By all accounts, the effort to reclaim a vacant surface level parking lot for public use was an astounding success (including being named 2014’s top project by Kentucky’s landscape architects). So much so that the city-sponsored event is back for a second round—Resurfaced Bourbon Edition—that opens on Thursday, June 4. “We took a site that no one cared for and turned it into something that people really enjoyed and loved,” Chris Poynter, spokesperson for Mayor Greg Fischer, told Broken Sidewalk in an interview Thursday. “When we closed Resurfaced last year people kept asking, ‘When are you going to reopen it? '” Since the first Resurfaced closed last October, the lot has been used for a variety of private events including a wedding and a Derby party hosted by Stephen Reily and Emily Bingham. Mayor Greg Fischer announced on May 7 that the popular pop-up beer garden and event space would return in the same location—a hollowed-out, 14,000-square-foot section of West Main Street behind the facades of four buildings that were demolished for the failed Museum Plaza skyscraper. And this summer is a perfect fit for a new bourbon-themed pop-up since the Kentucky Distillers Association is hosting its Bourbon Affair in June. “We wanted a complimentary event to their high-ticket event,” Poynter said. “We wanted something that could be open to everyone, and that could celebrate bourbon.” Bourbon and local food has been a major tenet of Fischer’s economic development push in Louisville, and Poynter added that the city is planning on launching a major food and bourbon–themed festival in 2016. The design for the new Resurfaced—by Louisville’s Patrick Henry Landscape Architects—was revealed today during a lunch with the mayor at Metro Hall. 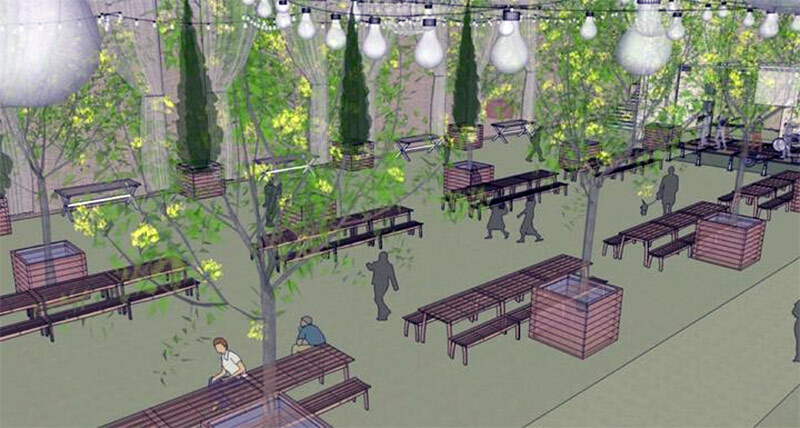 The plan includes a bourbon-themed mural that’s already in progress, bourbon-themed materials like barrel staves and bourbon barrel furniture, and live trees that will later be replanted around the city. But the whole point of interventions like Resurfaced is to bring about long-term change through short-term action. The vacant lot on West Main Street isn’t intended to become a popular events space. The idea, as Patrick Piuma put it, is to “previtalize” the site by showing community interest in it and attracting the eye of an interested developer. Resurfaced is not the end product, but rather just the beginning. Ultimately, the Fischer administration hopes the crowds flocking to Resurfaced will show a developer that there’s enough interest in the site to generate an infill building that retains the historic facades along Main Street. “We hope that over time the site will be redeveloped,” Poynter said. He added that a few companies have expressed interest to build an office building on the site, but no plans have been finalized. He said a previous proposal during the site’s Museum Plaza days to build business graduate school for the University of Louisville is long gone. 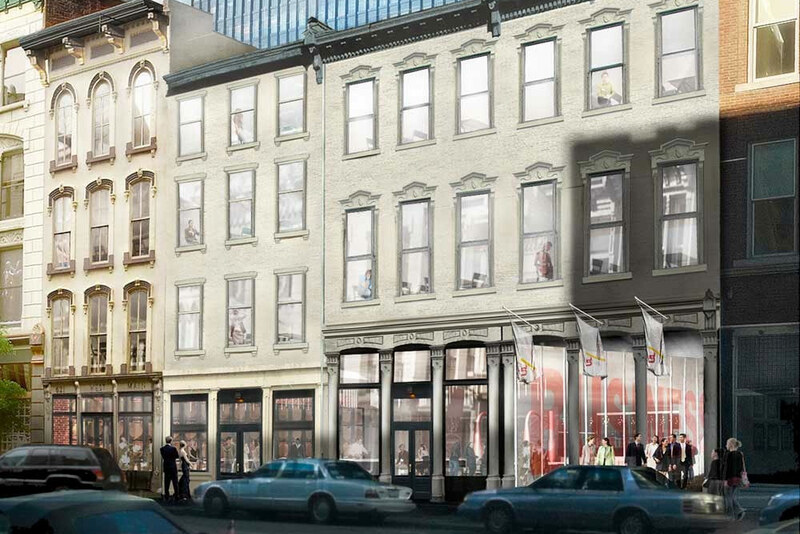 The crowds came once, they will come again this summer, and eventually a developer will nab this long-overdue development site in the middle of the most vibrant quarter of Downtown Louisville. Resurfaced has shown there’s a market and that people will come. Now we’re just waiting for vision and money. Piuma agreed. “The midterm goal is getting people to see what’s possible and think differently about how things get done,” he said. 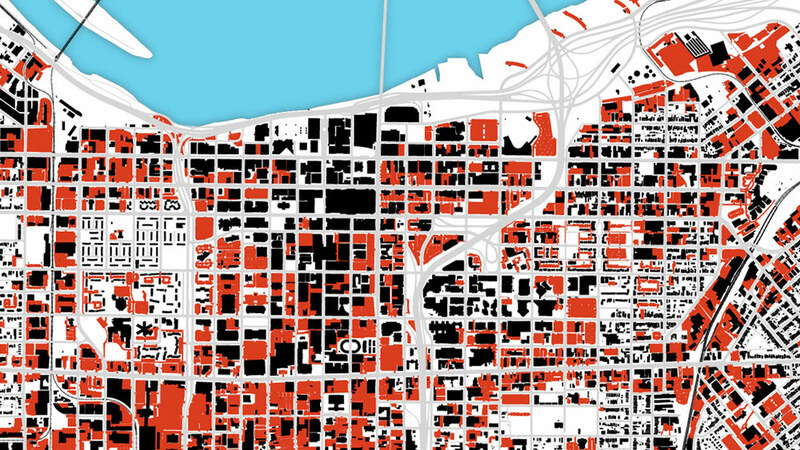 “The long term goal is to get people to do things on their own and weave back the urban fabric. It’s the previtalization aspect—showing that you can activate the space.” And there are plenty of potential Resurfaced sites around the city, with some 14.2 square miles covered in surface parking lots. Besides the accomplishment of Resurfaced itself, the change in the way the city is thinking about the built environment is another laudable achievement of the initiative. 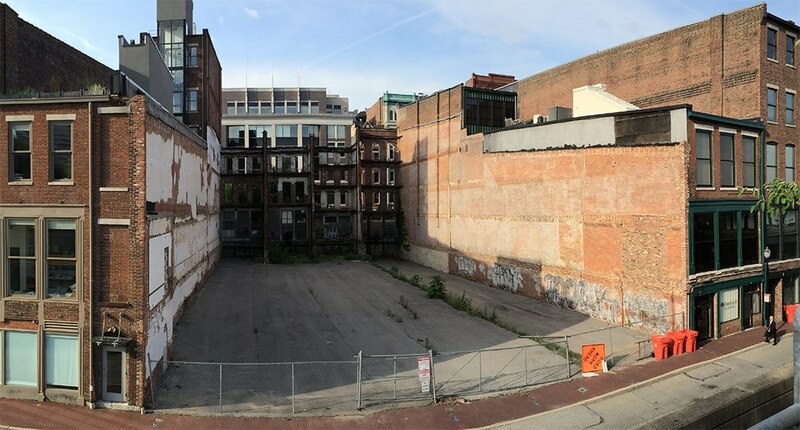 Louisville is facing a daunting challenge with the sheer amount of vacant and underutilized land around town—and 20th century thinking isn’t going to solve the problem. Tactical Urbanism, and the short-, mid-, and long-term goals it sets, helps to incrementally change the way urbanism works—and it’s working in Louisville. We’ve seen wildly successful Park(ing) Day events turn into the mayor’s Park(ing) Week, and then into a month-long vacant lot transformation. The city’s open streets program, CycLOUvia, also continues to redefine how we think about public space. What’s next? And the city must take the next step by codifying the philosophy of Resurfaced into a pavement to parks program such as exist in other cities from San Francisco, Seattle, and Los Angeles to Philadelphia, Chicago, and New York. While the private sector tackles redevelopment on the other side of the sidewalk, the city must really begin to look at how to change our built public space, by building parklets, pedestrian improvements, and new public spaces. And while we’re making progress on that front, the goal of a policy shift is still ongoing. “I’m not sure we’re there on a policy change yet, but we’re moving toward that,” Poynter said. And it’s good to know Louisville is at least moving rather than standing still. Resurfaced—and a splash of bourbon—will help us get there eventually. Later this summer, Poynter said Resurfaced will announce a third iteration on another “vacant property in a strategic part of town” but declined to give more specifics. “We’ll use that location to engage the community on what we can use the site for,” he said. Follow Resurfaced on its Facebook page and its website. Be sure to also check out our interview with City Collaborative’s Pat Smith about the Resurfaced initiative. Potion but useful to maintain facades. I would also suggest they mix a little mortar into that mural paint. Like Mayoral promises, these stage props don’t stand up long term .